I am a creature of habit making an annual trip to New York City every September since 2008. Needless to say, I covered some mandatory tourist must-do items already in previous trips. 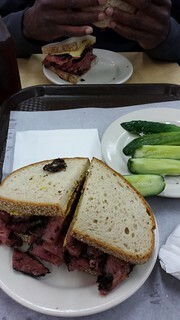 However, I always found my way back to Katz’s Deli and Junior Cheesecake every time I returned. Both are uniquely New York experience that I cannot replicate at home. 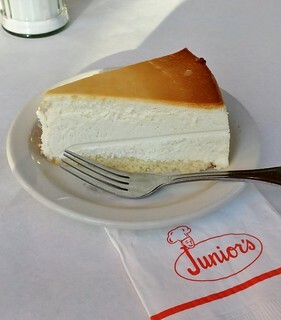 Besides, what can be a better birthday cake than a lofty slice of original cheesecake? 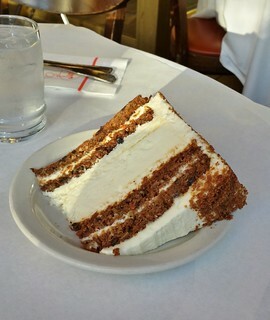 M’s choice of carrot cake cheesecake came in a close second but my love for the original remains unwavering. For convenience of traveling to the skating race, we stayed at hotel in downtown Brooklyn. 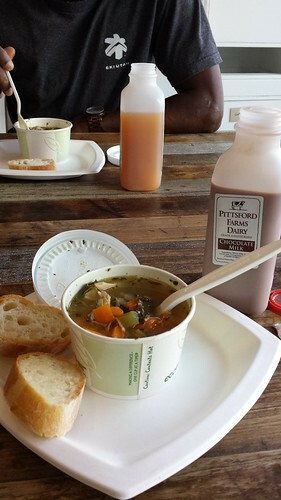 As soon as we dropped off our luggage, it was time to stroll over to BKLYN Larder for a casual lunch of soup, pressed sandwich, and homemade cookies. The made-from-scratch chicken noodle soup was comforting and their ginger molasses cookie received my discerning approval. But oh the sandwiches were good. 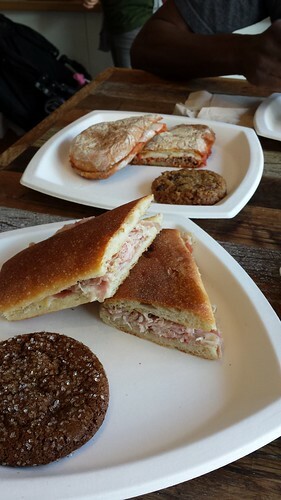 It was a tough call deciding which was better: my porchetta or M’s meatball provolone. After we polished off our lunch, I picked up many goodies from the well-edited selection at the store. 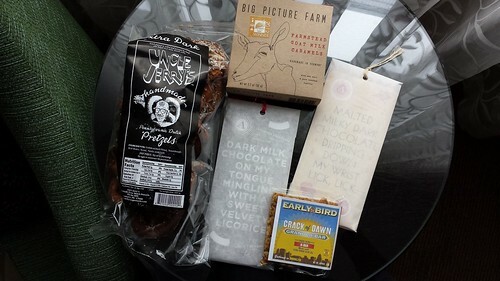 Who wants a I <3 NY t-shirt when you can have instead extra dark Pennsylvanian Dutch pretzels, award-winning goat milk caramels, Askinosie chocolate tablets, and Early Bird granola bar? 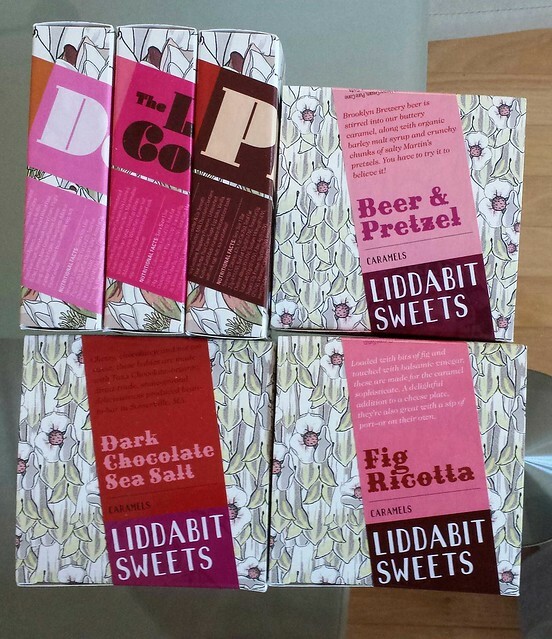 I have been a fan of handmade candies from Liddabit Sweets even though I only previously sampled their caramels. Reading their cookbook cover to cover only made me yearn to try all of the other selections. It’s no wonder I made it high priority to visit their store in Chelsea Market. I was not disappointed! I could not decide which flavours of caramel to buy so I bought both the seasonal ricotta fig and their signature beer & pretzel. Same with the chocolate bars. 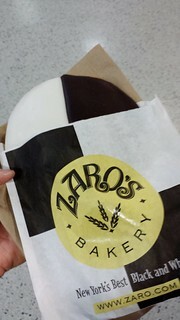 My indecisiveness turned out to be a very good thing because I filled my shopping bag with The Dorie, PB&J, and Coconut Lime. 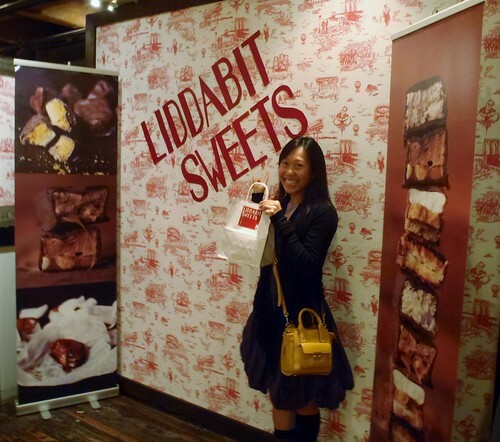 I went a liddabit crazy and even insisted that M take a photo of me at the store with my very heavy bag of goodies. Sensing my enthusiasm, the nice lady at the store gave me a complimentary box of dark chocolate sea salt caramel! That was totally unexpected and made my day. 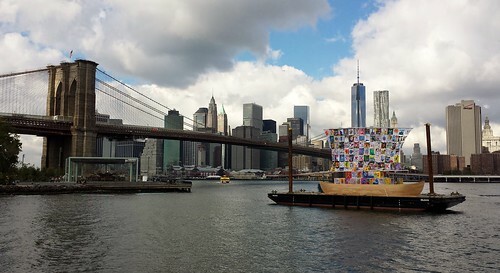 I was torn about our Sunday morning visit to DUMBO and Smorgasburg. On one hand, I was seriously tempted by all kinds of interesting bites from every food vendor. On the other hand, I had to save room for tasting menu lunch at Eleven Madison Park. It was a food lover’s dilemma. After much deliberation, I had cookies and pumpkin whoopie pie from One Girl Cookies, pork lumpia from Lumpia Shack, caliente chorizo quinoa arepa, and ginger cocada from Palenque Colombian food. It was a hard decision. Very, very hard. 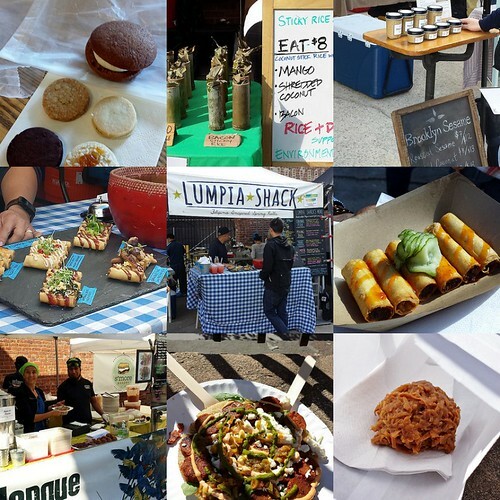 I will definitely return to Smorgasburg in future trips. 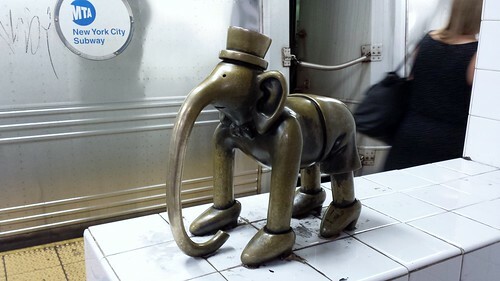 One of my biggest incentive to visit DUMBO was to check out Jane’s Carousel. 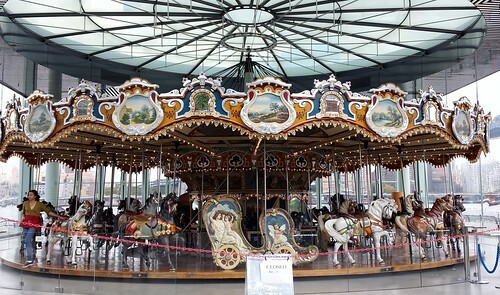 This restored carousel was installed at the Brooklyn waterfront in 2011 but it had taken years of hard work to return it to its past glory. 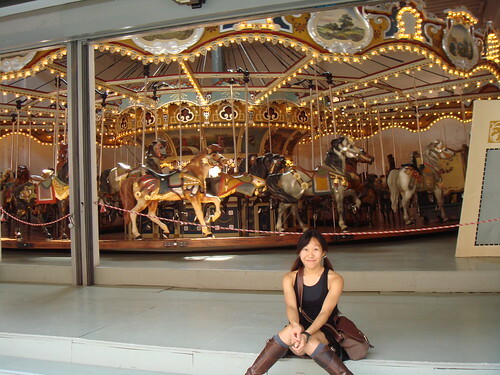 In 2010, I checked out the carousel in its last stages of restoration and I longed to see it running. I was not disappointed. It was magical to hear the tinkling music. When the twinkling lights lit up and the merry-go-round set into motion with the Manhattan skyline and Hudson river in the background, I almost jumped up and down in joy. 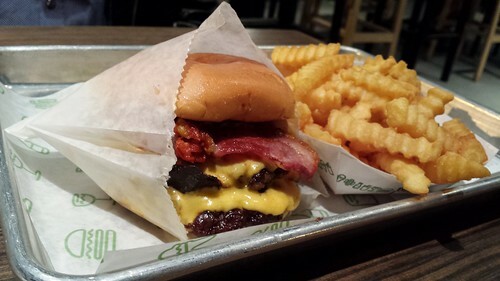 A Shake Shack burger falls squarely in the guilty pleasure category. M and I both had it before and we agreed that we would skip it this time. Funny how things don’t always go as planned but I can’t exactly complain about our change of plan. So Sunday our lunch at Eleven Madison Park stretched from noon to four. Very reasonable by tasting menu standards but it also meant neither of us were peckish came dinner time. We shopped at Soho and walked all the way to the tip of Manhattan to ride the free Staten Island ferry. The Statue of Liberty at night was such a pretty sight. When we finally returned to Brooklyn, it was very late. 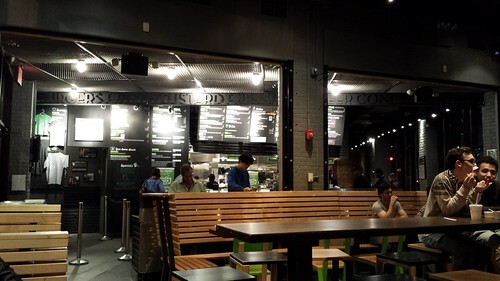 As soon as we stepped out of the subway station, the sign of Shake Shack glowed in front of us like a shining beacon. I was drawn to it as if mesmerized, mumbling “I’ll just go take a look”. Riiiiight. An order of Double Smoke Stack and crinkle-cut fries later, we felt satisfied if a bit greasy. Hey we shared! 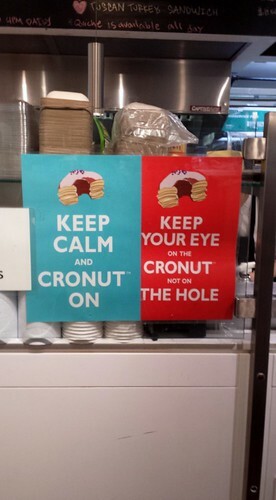 Unless you’ve been living under a rock, you must have heard about the cronut craze by now. 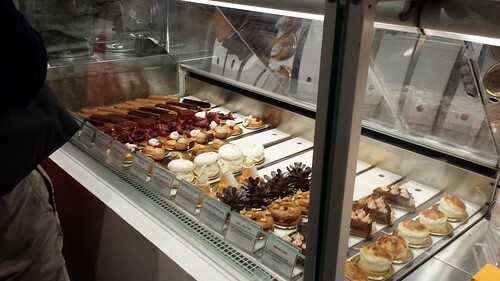 I am not curious enough to line up at the crack of dawn for a pastry but certainly interest enough to visit Dominique Ansel’s bakery on Spring Street. The Magic Soufflé is a feat of pastry ingenuity that fascinates me. 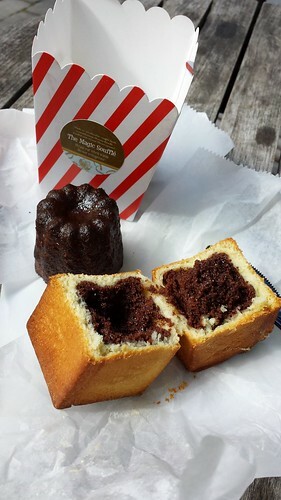 “Grand Marnier chocolate soufflé encased within a toasted orange blossom brioche”, of course I was intrigued. 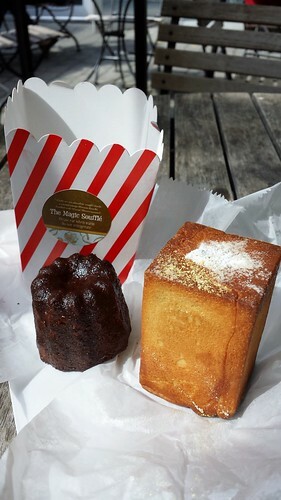 The made-to-order pastry was indeed delicious but M and I unanimously agreed that we enjoyed the canele even more. 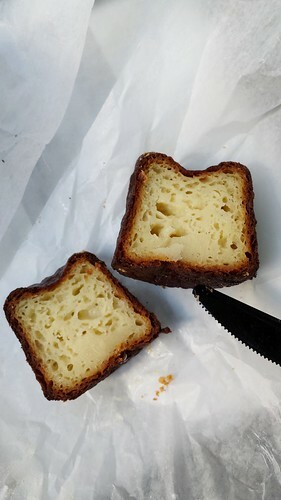 A deep crackly caramelized exterior with custardy center. I only hope to gain that kind of pastry finesse one day. 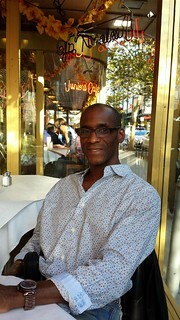 New York City, so much to love, so little time. I guess this just means I will return again next year. No complaints here. Nope. edited Oct 10, 2013: for those flying out of Newark, NJ, finding temporary storage for your luggage is a headache if you’re not staying in Manhattan. Luckily, there is a short-term luggage storage facility in Penn Station! The left luggage counter is located in the Amtrak station first floor between track 5 and 6. Just show up with a purchased train ticket (e.g. NJ Transit ticket to go to Newark) and they store your bags for the day. I paid $11 for two bags.